We manufacture a wide variety of nylon webbing products in different widths, colors, thicknesses, and prints. The versatility of our products allows for many uses, including pet leashes, child safety belts/restraints, tie-downs, cargo nets, sporting supplies, and more. We do abrasion tests, breaking strength tests, and colorfastness in house upon request and have the capability of making your nylon webbing flame retardant and/or water repellent. Our lab technicians can match your color and shade specifications. Special colors can be even be created with a minimum lot size order. Below are a few random samples of our nylon webbing that show available colors and weaves.We can pre-cut to different lengths, and bundle the pieces if required. 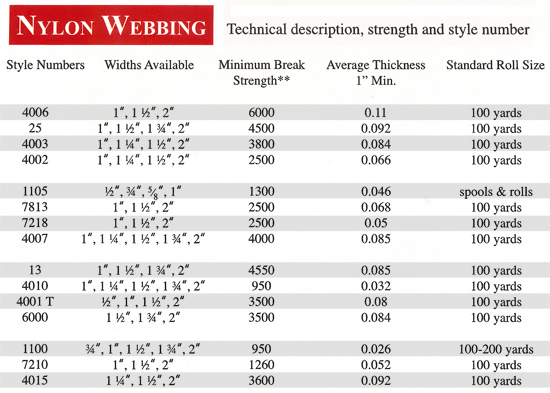 ** Break strengths listed for 1" only, except where noted, and are based on actual test data. All purchases must test their webbing for their specific use for breakage strength. Actual product color may change slightly due to atmospheric conditions. Nylon is one of the strongest materials on the planet. Nylon webbing is used throughout the world for its strength, versatility, and resilience to the forces of nature. Military, medical, and manufacturing businesses all employ nylon webbing when they want an affordable solution for straps of all kinds. 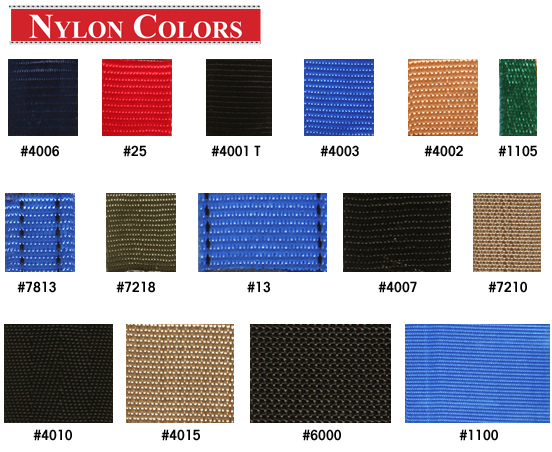 We at California Webbing Mills offer flat nylon webbing in various lengths, widths, and colors. 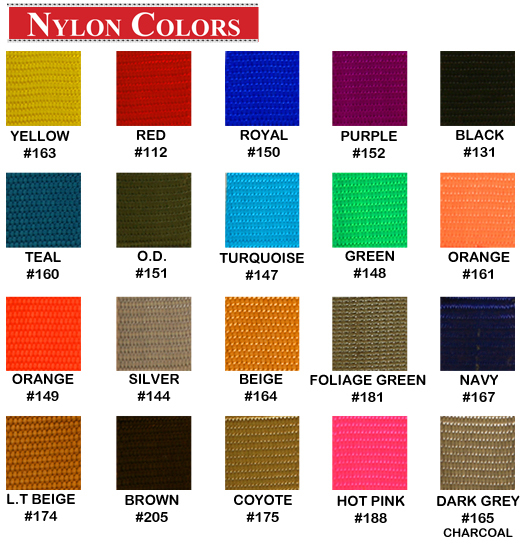 We can create nylon webbing in any color or shade upon request. Aside from the strength and resilience, flat nylon webbing is also safe and durable. At California Webbing Mills, nylon webbing can be treated in order to give it water repellant and fire retardant properties before being shipping to the customer. Strength, abrasion, and colorfast tests are also performed upon request. The nylon we sell is available in small or large lots. This means the average person trying to replace a lawn chair strap can order the small amount of flat nylon webbing they need with ease. Companies, on the other hand, assembling a large number of cargo straps for a business fleet of trucks have the freedom to order as many nylon webbing straps as they need to complete the job. When people have doubt as to how much nylon is a part of their lives, we ask them to look around and really pay attention to all the different applications nylon webbing straps are used for. Backpacks carry the weight of the world easily with nylon straps. Camera straps, luggage, footwear, and luggage all use nylon straps to protect important things in life. Pet collars and leashes are typically made with nylon webbing and nylon webbing buckles. Buckles are used to adjust collar length as needed. With flat nylon webbing, owners can cut the strap to the perfect size and attach nylon webbing buckles with ease. All in all, simple nylon webbing straps allow pet owners keep their pets safe and at a close distance. Whether you want to start a new fashion trend with a nylon webbing belt or create your own line of pet collars and leashes – California Webbing Mills has the materials you need. Nylon is a versatile material that is used in many aspects of life. So take a look around--do you see the power of nylon webbing in your life? Please feel free to contact us with your inquiries/questions.